In late November I pitched a story idea to my editor of Charlotte Hospitality News on all the upscale steakhouses that we have in Charlotte, from the ones that have been around for more than ten years to the ones that had opened in the past year. What I wanted to explore was whether or not this city could support that many high-end restaurants, particularly now that we were in a recession. My article was published in January, and since then the steakhouses have taken a hit. 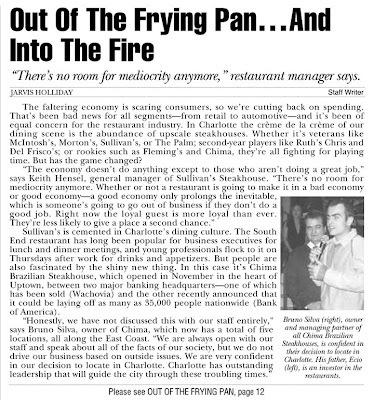 Morton's Steakhouse in SouthPark closed about two weeks after my article came out (the one in uptown is still open) and this past weekend McIntosh's in South End closed. Each of those restaurants were covered in the article, as were Sullivan's and Chima, and I mentioned the host of others: The Palm, Ruth's Chris, Del Frisco's, and Fleming's. I don't know how all of those places are doing, but I do know that Sullivan's recently had some turnover in management. And, coincidentally, I stopped in at Chima Friday night to go to their upstairs bar/lounge and they'd closed it at 10 p.m. I'm pretty sure the reason they closed the lounge early was because there weren't many people in there (the downstairs dining room was still open). I know this recession has us all being more frugal with our spending, but I'd hate to see us lose too many of our finest restaurants. Charlotte's restaurant scene has become one of the best in the South and most of that progress can be attributed to the last decade, along with most of the city's other growth. So ignore those Chick-fil-A cows and get out and eat more steak. You'll actually find that many of the steakhouses are offering more food and drink specials than ever, some of which is discussed in the article below.